I nearly cried in the post office. 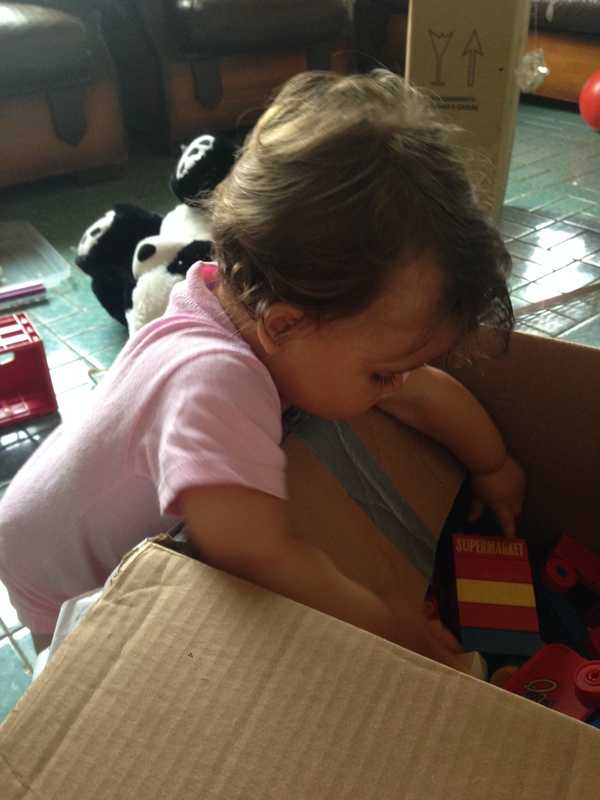 My mother sent us a box of used Legos, used baby clothes and other assorted items (none worth more than USD$10 each). The Brazilian Customs upon x-raying our box re-valued the items, deciding that in total they were worth R$350. They issued a tax based upon that worth. The state of Minas Gerais issued a second tax based upon that worth. 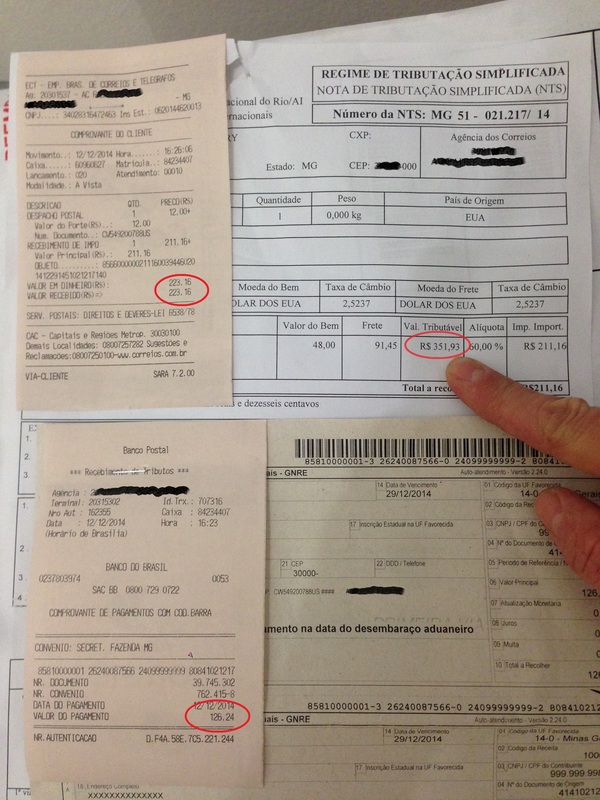 So, if you examine the two receipts on the left, you’ll see that we were charged a total of R$349 in taxes. 100% of the estimated value of our box. A minimum salary in 2014–what most around here earn unless you have a government job–was R$620. R$350 is approximately half my month’s salary. I was faced the with tough decision to pay, or send back the toys and books–some of them from my own childhood–and risk them getting lost. Feeling as though I was crumbling under the weight of emotional blackmail, I paid. This is the story of taxes in Brazil. In some ways it’s very smart–tax imports so that the national producers can thrive. In other ways it’s very, very dumb because many items essential to growing the country become inaccessible to the ordinary consumer. Cars are outrageously priced, and everyone dreams of someday if they really save maybe, just maybe they’ll own a Nissan Corrola. Many items simply don’t exist in Brazil (I’m looking at you window screens and industrial dishwashers) because there are few national producers and the imported versions are prohibitively expensive. It’s often even hard to produce items because–guess what?–the parts to start the factory are imported. It does explain why Brazil has a thriving black market. Until the import tax structure becomes more flexible and reasonable people will continue to work to thwart the system to get the items they crave. As for our box? Well, our daughter and the other kids at the farm are loving the Legos. So maybe it was worth it. This happened to me in Turkey as well. For Christmas I purchased “stocking stuffers” including a whoopee cushion and similarly ridiculous little gifts from a UK site. The total purchase price was $50US and it cost me $110 to get it out of customs! Most expensive whoopee cushion ever! I know, right? We did the math recently and realized over the past year we’ve almost paid a whole plane ticket’s value in import taxes! No more boxes for us–we’re going to go collect our items personally!